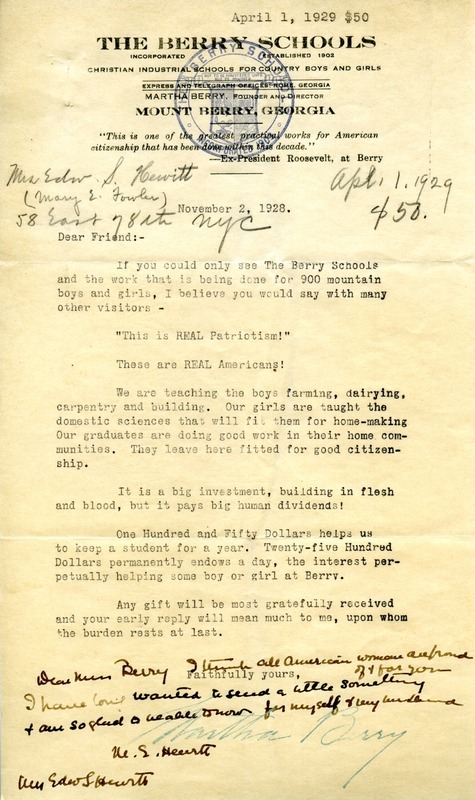 This is a letter from Miss Berry to Mrs. Hewitt requesting a donation to the schools. Mrs. Hewitt appears to have sent back a handwritten response on the original letter. Miss Martha Berry, “Letter from Miss Berry to Mrs. Hewitt with Response.” Martha Berry Digital Archive. Eds. Schlitz, Stephanie A., Kendra Laney, et al. Mount Berry: Berry College, 2012. accessed April 20, 2019, https://mbda.berry.edu/items/show/10265.